Approximately 65 photographs documenting the lives of inmates in Cyprus detention camps. Cyprus (a small number of photographs from Palestine), ca. 1947-1949. 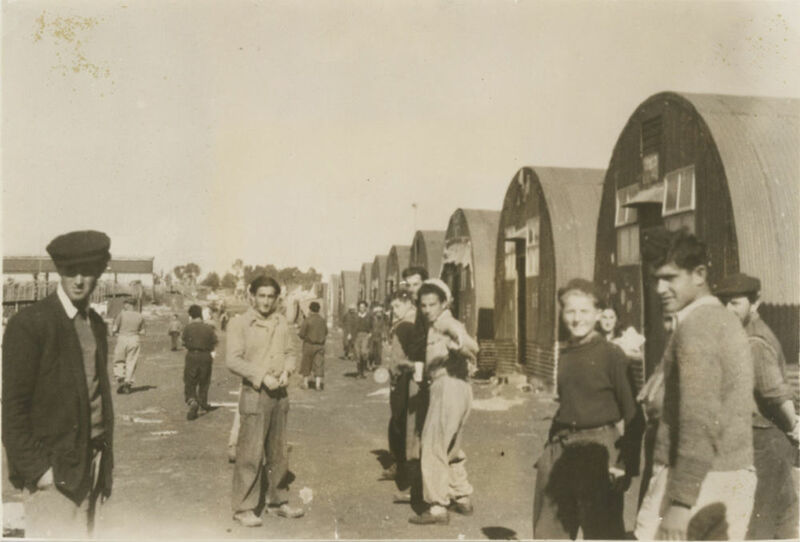 Documented in the photographs, among others, are: tents and tin barracks, drawing water from water reservoirs, work in the field, sports competitions, cultural events, Zionist groups in the camp ("Agudat Yisrael", "Ichud HaNo'ar HaZioni", "Shurot HaMaginim", "HaMifal LeBitachon Ha'am BeMachanot Cafrisin" and others), singer Shoshana Damari's performance on 28.4.1948, one of the camp's children learning how to lay Tefilin, camp's gate burning after being set on fire by the detainees, an escape tunnel dug in one of the barracks, Rosh HaShanah 5709 (1948) festivities in a tent, immigrants crowded near the gate before their liberation, and more. A number of photographs document the detainees on their way to Israel (among them photographs of the ships Ocean Vigour, Empire Rival and Empire Rest). In addition, the collection includes three souvenir cards from the detention camps, two with a photomontage of photographs from the camp and one with an illustration and a photograph. Pasted on the back of eight photographs are press information notes. Some photographs are titled by hand on the back. Six photographs are titled in the plate, and three are signed in the plate "Foto Sa-Ra" (active in camp 67), and "Foto Pais". Approx. 65 photographs, approx. 6X6 to 20X26 cm. (most photographs are small). Condition varies. Good overall condition. Some stains, creases and blemishes to some of the photographs.